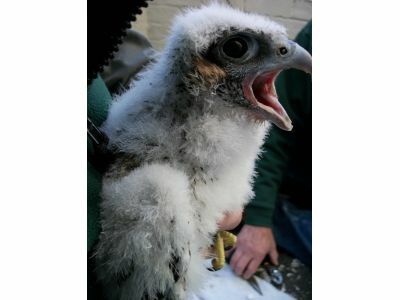 The Peregrine chicks have been wandering outside the nest box and exploring the ledge. They are not even close to being able to fly, but they are curious and somewhat clumsy. Their explorations are unnerving to watch and somewhat dangerous as it is a long drop down to the ground from the 13th floor if they misstep. One of the intrepid explorers tumbled into the parapet late this afternoon and is currently under the nest box. He is safe for the time being and a biologist from the Michigan Department of Natural Resources will attempt to get him back into the box early in the morning.